USS New Hampshire was named in honor of this state. New Hampshire is part of the New England region. It is bounded by Quebec, Canada to the north, Maine and the Atlantic Ocean to the east, Massachusetts to the south, and Vermont to the west. New Hampshire's major regions are the Great North Woods, the White Mountains region, the Lakes region the Seacoast region, the Merrimack Valley region, the Monadnock region, and the Dartmouth-Lake Sunapee area. New Hampshire was home to the famous geological formation called the Old Man of the Mountain, a face-like profile in Franconia Notch, until May 2 to May 3, 2003, when the symbol of New Hampshire collapsed. The Presidential Range in New Hampshire spans the central portion of the state, with Mount Washington being the tallest, and other mountains like Mount Madison and Mount Quincy Adams surrounding it. With hurricane force winds every third day on the average, 100 recorded deaths among visitors, and conspicous krummholz (dwarf, matted trees much like a carpet of bonsai), the upper reaches of Mount Washington claim the distinction of the "worst weather on earth." In consequence, a non-profit observatory is located on the peak for the purposes of observing harsh environmental conditions. 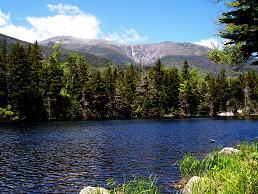 At 6,288 feet, Mount Washington is the tallest mountain in New Hampshire and New England. The fastest land wind speed in the world was recorded at its weather observatory. In the flatter southwest corner of New Hampshire another feature, the prominent landmark and tourist attraction of Mount Monadnock, has given its name to a general class of earth-forms, a monadnock signifying in geomorphology any isolated resistant peak rising from a less resistant eroded plain. The Cornish-Windsor bridge spans the Connecticut River at the New Hampshire-Vermont boundary.Major rivers include the 116 mile (187 km) Merrimack River, which bisects the state north-south and ends up in Massachusetts. Its major tributaries include the Souhegan River. The 410 mile (670 km) Connecticut River, which starts at New Hampshire's Connecticut Lakes and flows south to Connecticut, forms the western border of New Hampshire. Oddly, the state border is not in the center of that river, as is usually the case, but lies at the low-water mark on the Vermont side, so New Hampshire actually owns the whole river. The Piscataqua River and its several tributaries form the state's only significant ocean port where they flow into the Atlantic at Portsmouth. 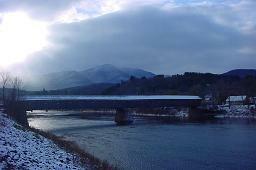 The Cornish-Windsor bridge spans the Connecticut River at the New Hampshire-Vermont boundary. The largest lake is Lake Winnipesaukee, which covers 72 square miles (186 km²) in the central part of New Hampshire. New Hampshire has the shortest ocean coastline of any coastal state, 18 miles (29 km) by state figures. (Under some federal definitions, Pennsylvania's coast is shorter). Hampton Beach is a popular local summer destination. About 10 miles (16 km) offshore are the Isles of Shoals, nine small islands (4 belonging to the state) best known as the site of a 19th-century art colony founded by poet Celia Thaxter, as well as the alleged location of one of the buried treasures of the pirate Blackbeard. The state has an ongoing boundary dispute with Maine in the area of Portsmouth Harbor, with NH claiming dominion over several islands (now known as Seavey Island) that include the Portsmouth Naval Shipyard as well as to the Maine towns of Kittery and Berwick. New Hampshire asserts the area was granted to it by Massachusetts prior to Maine becoming a state of its own rather than just the northern part of Massachusetts, in the Missouri Compromise of 1820. New Hampshire's claim is also bolstered by British records of captured American POWs during the Revolutionary period, who were held in England and claimed "Berwick, NH," "York, NH," and "Kittery, NH" as their home towns. A dramatic change in the visual landscape of New Hampshire occurred about a century ago when it changed from an open landscape of fields and small farms: It is now the second-most-forested state in the country, after Maine, in terms of percentage of land covered by woods. This change was caused by the abandonment of farms by owners seeking wage jobs in urban areas or bank seizure of unproductive farms, with farming families moving west. The reversion forms the subject of many poems by Robert Frost, while the emigration is consistent with the results of NH native and newspaper legend Horace Greeley imploring, "Go West, Young Man." New Hampshire was founded by Captain John Mason and first settled in 1623, just three years after the Pilgrims landed in Massachusetts and it was one of the thirteen colonies that revolted against British rule in the American Revolution. It was the first state to declare its independence, and the historic attack on Fort William and Mary (now Fort Constitution) helped supply the cannon and ammunition needed for the Battle of Bunker Hill that took place north of Boston a few months later. In the 1830s, NH saw two major news stories: the founding of the Republic of Indian Stream on its northern border with Canada over the unresolved post-revolutionary war border issue, and the founding of the modern Republican Party by Amos Tuck and friends. New Hampshire grew as a hotbed of Abolitionist sentiment up to the Civil War, participating in the Underground Railroad in providing safe routes into Canada, primarily via the Connecticut River waterway. In the 20th Century, NH gained political renown for its First in the Nation political primaries which tended to accurately predict who would be elected President of the United States. 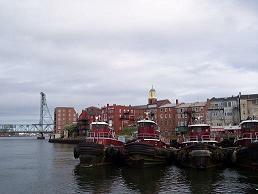 Settled in 1623, Portsmouth, NH is one of the oldest towns in the Granite State and the former Capitol. The New Hampshire state capital is Concord, which has also been known over time by the names Rumford and Penacook. The governor of New Hampshire is John Lynch (Democrat). New Hampshire's two U.S. senators are Judd Gregg (Republican) and John E. Sununu (Republican), whose father John H. Sununu was governor of the state from 1983–1988. New Hampshire and Vermont are the only states that still elect governors to two-year, rather than four-year, terms. New Hampshire has historically been dominated by the Republican party. However, in national elections it has become a swing state. 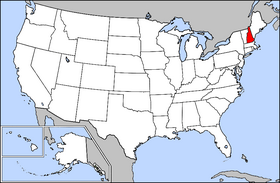 In 2004, New Hampshire narrowly gave its four electoral votes to John Kerry with 50.2% of the vote. In the 2000 presidential election, New Hampshire narrowly supported George W. Bush. The state supported Clinton in 1992 and 1996, but prior to that had only strayed from the Republican party for three candidates—Woodrow Wilson, Franklin D. Roosevelt, and Lyndon B. Johnson. Unlike other northeastern states, Republicans still dominate most local and state offices. Democratic strength is greatest in Strafford, Cheshire, Grafton, and Merrimack counties. Unlike most states, New Hampshire does not have a Lieutenant Governor; the Senate President serves as "acting governor" whenever the governor is out of the state, or otherwise unable to perform the duties of the office. Instead, New Hampshire has a bifurcated executive branch, consisting of the Governor and a five-member Executive Council that is a holdover from the Governor's Council of the Colonial era. The Executive Council's duties include voting on state contracts worth more than $5,000, "advising and consenting" to the governor's nominations to major state positions such as department heads and all judgeships. The New Hampshire state legislature, called the General Court, is made up of the House of Representatives and Senate. The House of Representative has 400 members in the House, which is reportedly the third-largest legislative body in the English-speaking world, behind only the United States House of Representatives and the British House of Commons. By contrast, the Senate has just 24 members. State representatives and senators are paid $100 a year, plus mileage and bonuses for committee assignments, effectively making the state legislators volunteers. Because of the amount of pay, many New Hampshire lawmakers are either wealthy or retired. New Hampshire's government has earned the positive attention of residents in neighboring Vermont: Killington, Vermont has twice voted to secede from Vermont and join New Hampshire—a largely symbolic act, since secession would require the agreement of both states' legislatures and the U.S. Congress. Supporters of the sucession note that almost all Vermont towns were first chartered by New Hampshire, and point out that these two states already have some unusual cross-border links, including the only two interstate school districts in the United States. Although the state retains the death penalty the last execution was conducted in 1939. In 2000, the General Court passed HB1548-FN, which would have abolished capital punishment but it was vetoed by Governor Jeanne Shaheen, a Democrat. In 2005, a law passed raising the minimum age for capital punishment from 17 to 18 years-old, fueled largely by the United States Supreme Court's ruling in Roper v. Simmons (2005). In the state, 17 year-olds who commit misdemeanors or felonies are automatically tried as adults. New Hampshire has a Libertarian-like political tradition that values individual freedom and weak state governmental powers, although the Libertarian party does not do well in elections when compared to the Democrat and Republican parties. Much of the authority in the state is in the hands of municipal governments. In 1995, with the passage of Senate Bill 2, municipalities were able to continue conducting town meetings the traditional way, or change to ballot voting. The Bureau of Economic Analysis estimates that New Hampshire's total state product in 2003 was $49 billion. Per capita personal income in 2003 was $35,140, 7th in the nation. Its agricultural outputs are dairy products, nursery stock, cattle, apples, and eggs. Its industrial outputs are machinery, electric equipment, rubber and plastic products, and tourism. New Hampshire experienced a significant shift in its economic base during the last century. Historically, the base was composed of the traditional New England manufactures of textiles, shoe-making, and small machining shops drawing upon low wage labor from nearby small farms and from Quebec. Today, these sectors contribute only 2% for textiles, 2% for leather goods, and 9% for machining of the state's total manufacturing dollar value (Source: U.S. Economic Census for 1997, Manufacturing, New Hampshire). These traditional sectors experienced their sharp decline during the Twentieth Century due to increasingly obsolete plants and increasingly cheaper wages available in the US South. The current New Hampshire economy is largely driven by fiscal policy. The state has no personal income tax and advocates a frugal budget, thereby attracting commuters, light industry, specialty horticulture, and service firms from other jurisdictions with high tax policies, notably from neighboring Massachusetts. This is a viable fiscal policy for a small, high-income state with limited social service demands, but it has not been one hundred per cent successful, and pockets of depressed manufacturing activity still remain. Additionally, New Hampshire's lack of a broad-based tax system (aside from the controversial state-wide property tax which former Governor Benson cut nearly in half in two years) has resulted in the state's local communities having some of the nation's highest property taxes, yet overall NH remains ranked 49th in combined average state and local tax burden, due to its lack of income or sales taxes. 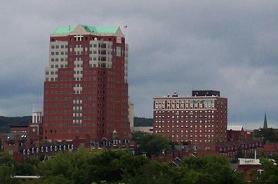 Manchester is New Hampshire's commercial, economic, and financial hub. As of 2004, the population of New Hampshire was estimated to be 1,299,500. This includes 64,000 foreign-born (4.9%). The five largest ancestry groups in New Hampshire are: Irish (19.4%), English (18%), French (14.6%), French Canadian (10.6%), German (8.6%). People of British ancestry live throughout most of New Hampshire, although Coos and Hillsborough counties are predominantly French-Canadian. New Hampshire has the highest percentage of residents of French/French-Canadian ancestry of any state. Manchester, is the most populous city in the state giving it the nickname of the "Queen City." The Merrimack River runs through the city and once provided water power to a textile mill industry. Nashua, New Hampshire, the second-most-populous city, was twice named the best city in the country to live by Money magazine. Keene is still called "The Elm City" despite the fact that Dutch elm disease destroyed most of the city's elm trees in the 1930s. Keene is the home to Keene State College. Salem contains The Mall at Rockingham Park, frequented by Massachusetts residents to avoid paying sales tax; Canobie Lake Park, an amusement park; and Rockingham Park, New England's first racetrack for horses. Peterborough is the inspiration for the town of Grover's Corners portrayed in Thornton Wilder's play Our Town. Lebanon is known as "The City of Fountains." It contains Lebanon College and the Dartmouth Hitchcock Medical Center and is the location of many malls along the Connecticut River that draw Vermont shoppers avoiding that state's sales tax. 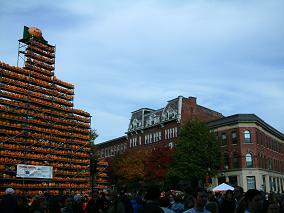 Keene's Pumpkin Festival attracts thousands of visitors each year. Established in 1769, Dartmouth College is an Ivy League school in Hanover, NH. It is one of the oldest colleges in the United States. New Hampshire Fisher Cats Logo. The New Hampshire Constitution is the nation's only state constituion that allows the Right to Revolution. New Hampshire was the last of the New England states to observe Fast Day, a day of prayer for a bountiful harvest. Traditionally observed on the 4th Thursday in April, from 1949 was observed as a legal holiday on the 4th Monday in April until 1991 when it was replaced by Civil Rights Day. In 1999 New Hampshire changed the name of Civil Rights Day to Martin Luther King, Jr. Civil Rights Day. There are no general sales or individual income taxes in New Hampshire, though the state does have meals, lodging, and other taxes. New Hampshire is the only state that does not mandate public kindergarten, partly out of frugality and lack of funding, and partly out of belief in local control, a philosophy under which towns and cities, not the state, make as many decisions as possible. As of 2003, all but about two dozen communities in the state provided public kindergarten with local property-tax money. Like several states, New Hampshire requires all hard liquor to be sold in state-owned, state-run stores. This system generates millions of dollars annually for the state and results in liquor being so cheap that it attracts many out-of-state customers. Many liquor stores are located near state lines, often on interstate highways (with their own exits). New Hampshire is host to the New Hampshire Highland Games, formerly the Scottish Games. New Hampshire has also registered an official tartan with the proper authorities in Scotland; this tartan is used to make kilts worn by the State Police while they serve during the games. New Hampshire has the only piece of Interstate highway that is two-lane (i.e. a single northbound lane and a single southbound lane) with a cobblestone median. This was done to preserve Franconia Notch, the site of the Old Man of the Mountain, a rock formation visible from Interstate 93 in Franconia. The formation, the state symbol, fell apart due to natural erosion on May 3, 2003. In northern New Hampshire the town of Dixville Notch is traditionally the first city or town in the U.S. to vote in presidential primaries and the presidential election. The few dozen residents of Dixville Notch all stay awake until after midnight to vote. State law grants that a town where all registered citizens have voted may close early and announce their results. New Hampshire is the only state with no mandatory seatbelt law for adults, no motorcycle helmet law for adults nor mandatory vehicle insurance for automobiles. New Hampshire is the destination of the Free State Project. EXTENDED FOOTNOTE on coastline. Official figures recognize two coastal concepts, the coastline and the shoreline. The coastline is a generalized measurement of the shore configuration, whereas the shoreline is the most detailed measurement practical and includes measurements for offshore islands and other features such as inlets and rivers to the head of a narrow tidewater. Based on these concepts, Pennsylvania has a saltwater coastline of 0 miles, so it cannot be considered for ranking in a discussion of saltwater coastlines, but when the more detailed measurement of shoreline is used, Pennsylvania has a saltwater shoreline of 89 miles versus 131 for New Hampshire, giving Pennsylvania a shorter ocean shore. Pennsylvania's number apparently comes because a portion of the Delaware River on its southeastern border is tidal. Source: U.S. Dept of Commerce, "U.S. Coastline by States" cited on Page 606 of the 2003 "World Almanac." On January 5, 1776 at Exeter, the Province of New Hampshire ratified the first independent state constitution, free of British rule. In 1908, Monsignor Pierre Hevey organized the nation's first credit union, in Manchester, to help mill workers save and borrow money. The first ballot of New Hampshire's Presidential Primary has been cast in the Ballot Room of the Balsams Hotel in Dixville Notch since 1920. In 1963, New Hampshire's Legislature approved the nation's first legal state lottery. In 1828, the first Woman's strike in the nation took place at Dover's Cocheco Mills. In 1845, the machine shop of Nashuan John H.Gage was considered the first shop devoted to the manufacture of machinists' tools. Finished on June 27, 1874, the first trans-Atlantic telecommunications cable between Europe and America stretched from Balinskelligs Bay, Ireland, to Rye Beach, New Hampshire. In 1966, Ralph Baer of Sanders Associates, Inc., Nashua, recruited engineers to develop the first video game, patented in 1969. Christa McAuliffe of Concord became the first private citizen selected to venture into space, she but perished with her six space shuttle Challenger crewmates in the January 28, 1986 mishap. On May 5, 1961, Alan B. Shepard Jr. of Derry rode a Mercury spacecraft and became the first American in space. On August 29, 1866, Sylvester Marsh demonstrated the first mountain-climbing "cog" railway. On February 6, 1901, a group of nine conservationists founded the Society for the Protection of New Hampshire Forests, the first forest conservation advocacy group in the US. On June 12, 1800, Fernald's Island in the Piscataqua River, became the first government-sanctioned US Navy shipyard. 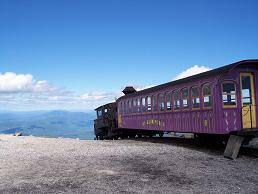 The Mount Washington Cog Railway.